Lots of information and other stuff seem to just come my way, so that I can use them for my articles, videos etc. The Brahma Kumaris song ‘Seed of the Living Tree’ was also something that came my way so that I can use it in an appropriate manner. Recently, I made some videos on the articles which I wrote. So, I wanted to make some video clips of myself (which I could use to introduce myself as the speaker, at the end of the videos). My son had taken some videos, during our holidays, and I decided to use some of those video. I selected the portions which I wanted and turned them into short video clips. I wanted to insert BK music or song as a background for them. So, I arranged the video clips in the movie maker. Then, I did a search in youtube for BK songs. However, I only got one song titled “Seed of the Living Tree”. The others (in the search) were BK talks etc. I was disappointed because, usually, many songs come when I make a search. Further, I did not really like the English BK songs. I preferred the Hindi songs. So, I was planning to use a Hindi song. But since I wanted to make sure that I could download the MP3 version and use it in the movie maker, I just downloaded this song titled “Seed of the Living Tree”. If it worked, I wanted to choose a nice Hindi song to use. But when I put the song and the clips together, I was shocked to see that the words of the song matched very well with what I was doing in the video clips. I tried to re-arrange the clips to make it more appropriate for the song. But this had only messed it up. So, I removed everything and imported the video clips, again, in a similar manner to what I had done earlier. Again, the video clips matched the words, in the song, very well. In the arrangement of the video clips, there were 2 video clips taken near the sea-side (with the Ocean view). The word “Ocean” (sung in the song) co-incided with these 2 Ocean video clips. Actually, there are more scenes where I could have used the Ocean video clips because the word “Ocean” can be found more than 2 times in the song. But I did not dare to add more clips because it might mess it all up again. I just took one of the Ocean clips and put it at the end, and I put the clip that was at the end in it’s place. Everything, in the video, was still fine after I did that. So, I left it that way; and made a video out of it. This is the video that was up-loaded in youtube titled “Song – Seed of the Living Tree”. Then, I tried to add transitions and make more amendments in the arrangement of the video clips (in the movie maker) so that I could get a better video. However, again, it only got messed up. So, I decided to just use the video which I had already made (which got arranged without much effort on my part). It was like as if my son took the video shots while I was doing the appropriate acts for the video. It was as if I got the videos clipped, based on what was needed in the song. It was as if the order in which it was taken and clipped was based on how it should be in the song. When things like this happen, I would say that “everything was happening as it should, so that I can get what I need to use”. I had placed other clips in between the clips in the park because I wanted to use some variety. Though the arrangement seems so well matched, the scenes in the video does not explain the actual meaning of what is being sung. For example, the Ocean in the song does not refer to the physical ocean (as it is represented in the video). The Ocean, in the song, refers to God and His Mighty Powers. The scenes of the trees, in the video, seem to flow along well with the words “Seed of the living tree” (in the song). However, the living tree, in the song, is not the trees. The living tree represents the corporeal world in which the human souls live their life. It is as if a new corporeal tree is growing in the Confluence Age, now, as we make spiritual effort to transform the world into a divine world. Since the tree is growing, it is living. The Seed represents God. Through using God (as the Seed), the new corporeal world is growing now (though it is not visible as yet in the corporeal form). Since God is used for the new living tree to grow, God is referred to as the Seed of the Living Tree. At one point in the song where it is sung “It’s Light shines endlessly” I happen to look up at the sun (from where light is shining). I actually did not plan it this way. My looking up had co-incided with the words without any of my planning. I was so happy that it co-incided so beautifully. But after the video was posted, I began to realise that this scene might give the wrong impression that the Light (mentioned in the song) was the sun’s light. Actually, the Light (in the song) refers to God’s light shining endlessly on us. God is not the sun. He is just a Point of Light who can be seen as an enlarged Point of Light, in visions. We can also see Him as an enlarged Point of Light, for convenience. The up-ward climb, in the song, is not climbing up the stairs as was done in the video. The upward climb represents the spiritual climb up the World Ladder, towards the creation of the new world. The upward climb refers to the spiritual strengthening of the soul. The path to freedom, in the song, is not the path along the park. The path to freedom is the spiritual path which we are taking, in the Confluence Age, so as to reach the pure world of the Golden Age (where we enjoy freedom in everyway). In the song, as the words “new way” or “journey” is sung, the scene is of a pathway in the park. This was not what was meant in the song. The Confluence Aged Raja Yogi’s “new way” or “journey” is also not one among the trees (as we had introduced for bhakti during the Copper Age). The “new way” and “journey”, mentioned in the song, is the spiritual journey. The making of this video is, actually, also setting the stage for what I have to do during the Confluence of the Silver and Copper Ages. Whatever I do now will influence me in Copper Age. What I do in the Copper Age will help me with my explanations now. This is all part and parcel of the immortal role which I use. So, I hope BKs do not make statements that I am leading people away from the Truth through what I am doing here in the internet. Actually, I dare not go to the BK centers anymore (for fear that someone there might question me on what I am doing in the internet). Whatever I am doing here is, actually, not in my hands. Sometimes, (from 1996) I had seen my past birth, who had walked out of the divine world, looking sad like as if he was not happy with his role during the Confluence of the Silver and Copper Ages. I would think that there was nothing wrong with his role. Then, from the beginning of 2001, after I stopped going regularly to the Brahma Kumaris, I had visions where I saw myself as playing a role for destruction or as Sekhmet. When I was having those visions, I was in a blissful state. But after I come out of those experiences I would slowly become sad because I did not like this role of being involved with ‘destruction’. To me, it had seemed like an evil role; though it did not seem evil in the visions. It had just seemed like a role in the visions. Though I did not like the role, I had just flowed along and done what I had to do, when things came my way. Maybe, I just flow along because I do not really have a choice (though we have the choice to do what we want to do). About 1 or 2 years ago, I had materials to create a red box. So, I created it so that I can place all my health stuff in it. I wanted to feel that my health was in God’s hands. After I had completed it, I was given the understanding that this box is now going to influence me, in the next cycle, to create red boxes to represent the Arc of the Covenant. When I was given this understanding, I did not use the box for sometime because I did not want to do anything to mess things up in the next cycle. 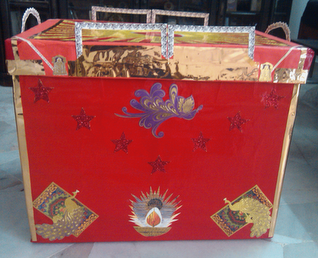 But the box looked pretty and so, after sometime, I began to use it. However, I kept it out of my sight; so that I do not see it all the time. I felt that if I did not see it much, it will not influence me much in the next cycle. If I did not use the box, would it change what would happen in the future cycle? I don’t think so. Whatever has to happen, will happen. So, it is not in my hands. Further, I was not the one who messed it all up. It was the later generations, who had used what we had left behind (to create new stuff for what they were starting), who had helped to mess it up. Then, confusion had helped to mess it all up further. But, sometimes, confusion also starts as a result of what is done now. For example, in the video (Seed of the Living Tree) when it is sung “Patiently, He calls us. Etc”, it refers to God doing it. However, in the video, I was doing something which seems to match well with the words too. But I am not God. It can be said that what I was doing represented God doing it on earth. This will influence us to play the roles as/for God on earth, during the Confluence of the Silver and Copper Ages. Thus, Enlil, Enki and others were portrayed as playing God’s role on earth. But this later brings about confusion as to who God is. BKs do not like this messed up state, though they are taught to just remain in the soul-conscious stage when they are faced with the confusion that exists outside. If what I am doing, now, is going to mess it all up again for the BKs during the next cycle, that is also happening as per the World Drama. But things will not just get messed up for the others. They also get messed up for me because I have to explain what was being left behind. However, I cannot do anything about it because it all happens as per the World Drama. At one point in the video of the song (Seed of the Living Tree), when it is sung “words of love unspoken”, it seems like as if I was talking but to nobody. So, it is like as if it was ‘unspoken’ since there was nobody in the direction in which I was speaking. There are also other scenes in the video where I seem to be talking to ‘nobody’. I was wondering if people will wonder if I am mad, talking to ‘nobody’. Actually, I was either talking to the people around there or to my son with the camera. Maybe, this was also a reason why people would portray 2 of my past births as being ‘mad’ though they were not. Whatever has to happen, will happen as per the World Drama. 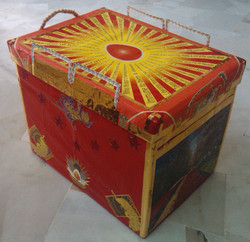 The pictures below are of the red box which I had made and which is supposed to influence me in the Copper Age.